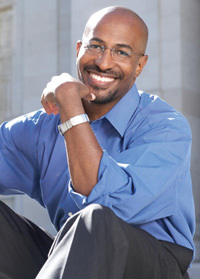 Our guest this hour is author, innovator, former Obama White House advisor, and activist Van Jones. Jones is an internationally renowned human rights and clean energy advocate, and is co-founder of the Rebuild the Dream campaign, a platform for ways that regular people can help transform the U.S. economy. At the end of the hour, we have a short tribute from our archives to Studs Terkel, who was born 100 years ago today.